Cinara juniperi apterae are rather more rounded in profile than most species. They are pinkish-brown under a variable thickness of fairly uniform wax dusting covering all the dorsum (cf. Cinara mordvilko where the posterior is wax free). The legs are dark brown to black and the hind tibiae are all dark. Antennal segment V is less than 0.9 times the length of segment VI (cf. 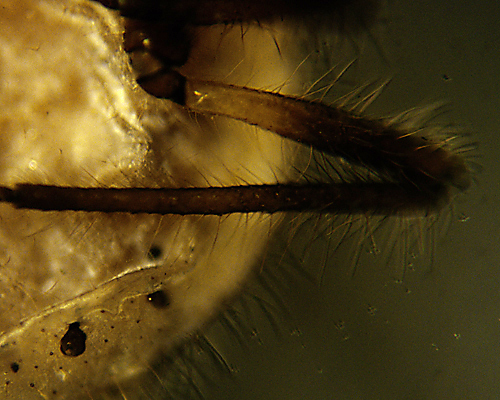 Cinara mordvilkoi which has antennal segment V 0.85-1.05 times the length of segment VI). The ratio of the length of the last two segments of the rostrum to the length of the second segment of the hind tarsus is 0.60 to 0.85 (see third micrograph below, which shows the length of rostral segments compared to hind tarsal segments). The hairs along the outer side of the hind tibia are at least 1.5 times (mostly 2 to 3 times) the diameter of the tibia in the middle (see fourth micrograph below). The chocolate brown. dark siphuncular cones are relatively large. The body length of the Cinara juniperi adult apterae is 2.1 to 3.4 mm. The micrographs below show a Cinara juniperi aptera in alcohol (dorsal and ventral). 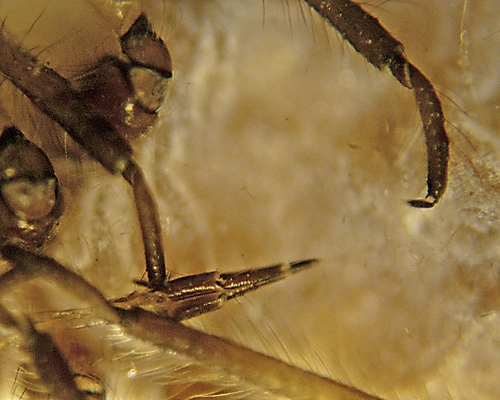 The micrographs below show (1) shows the length of rostral segments compared to hind tarsal segments and (2) showing relative length of tibial hairs and width of hind tibia. The coloration of Cinara juniperi is rather variable. 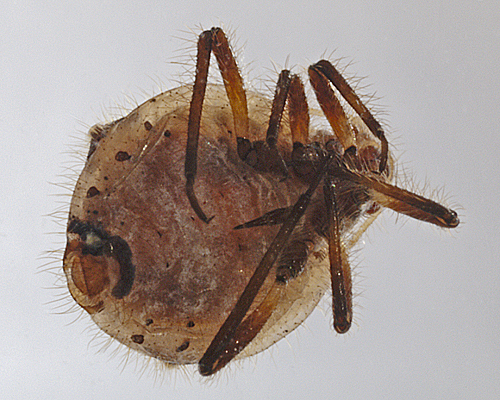 Sometimes the pinkish-brown coloration described above is very marked as in the specimen below. Most specimens have a moderate thickness of wax, but the underlying pink colour is still apparent (see picture below). In other specimens the grey wax coating is thick enough to obscure the pink coloration. Cinara juniperi feed on the needles and young shoots of juniper early in the season, but later in the year they move to the base of shoots and young branches. Jaskiewicz & Kot (2007) described the population dynamics of Cinara juniperi in Poland. The first individuals of this species were most frequently observed at the turn of April and May, while the maximum population was found in the first half of May. 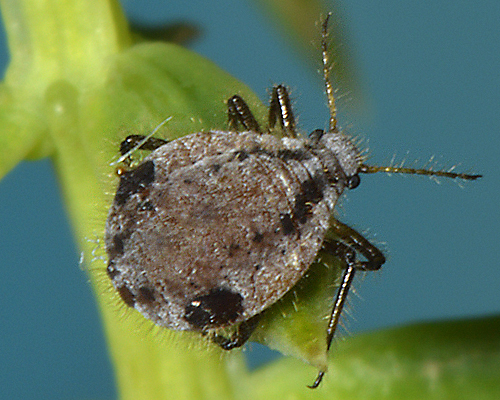 The course of the weather conditions affected the aphid's population dynamics. They usually disappeared by the end of July. On the other hand, dry periods at the end of June and in July, with heavy stormy rainfalls, caused their population size to crash. The presence of Cinara juniperi was observed first of all on the bottom part of young twigs of common juniper, where they lived individually or in small colonies. They caused, especially in the period of the largest number, browning and drying out of the needles - and inhibited the stems' growth. Durak (2016) looked at how global warming may affect populations of Cinara juniperi in Poland. 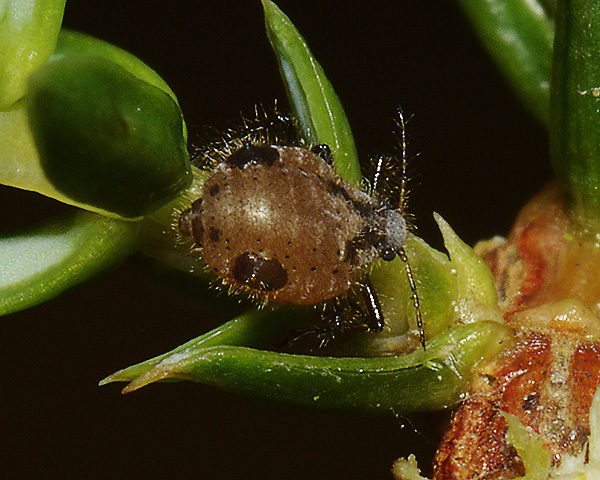 Environmental conditions were found to significantly affect the phenology of the juniper aphid. The timing of larval emergence depended on mean temperatures in March, and in warmer years larvae appeared earlier. The emergence of the sexual generation was related to mean temperatures in August, and higher temperatures resulted in later sexual reproduction. Despite the elongation of the entire life cycle, by almost 3 months, they observed only one additional generation in warmer years. It was suggested that this was because the increase in temperature recorded in recent years went beyond the temperature optimum of the study species. 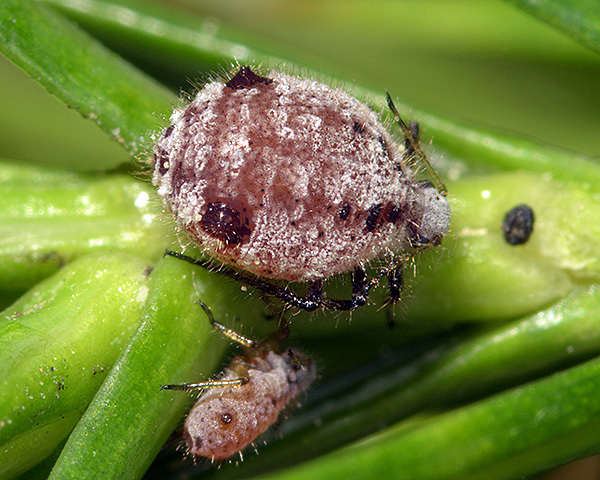 Subsequent experimental work showed that juniper aphids developed faster and reproduced more effectively at 20 °C than at 25 °C. Cinara juniperi is a facultative myrmecophile - in other words it may or may not be attended by ants. 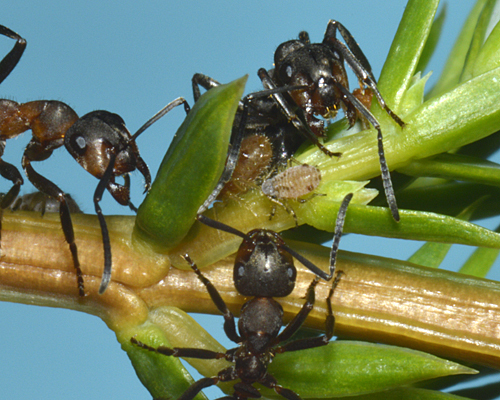 Baker (2012) reported that Formica lugubris attendance of Cinara juniperi at Dundreggan in June 2012 was casual, did not persist for long and involved individual ants rather than clusters of ants attending clusters of aphids. At that time Cinara juniperi was abundant and ubiquitous on juniper trees. 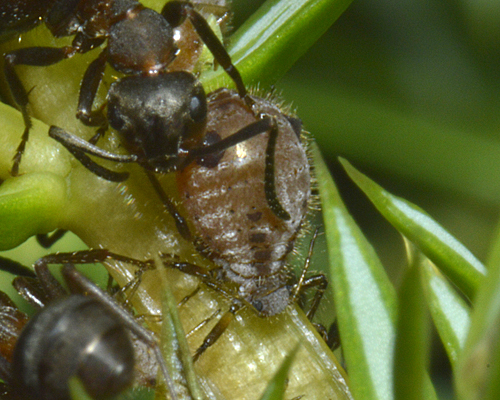 He also noted that Formica lugubris struggles to manoeuvre amongst juniper needles, making it difficult to feed on honeydew from Cinara juniperi, which typically feeds on foliated stems and needles. 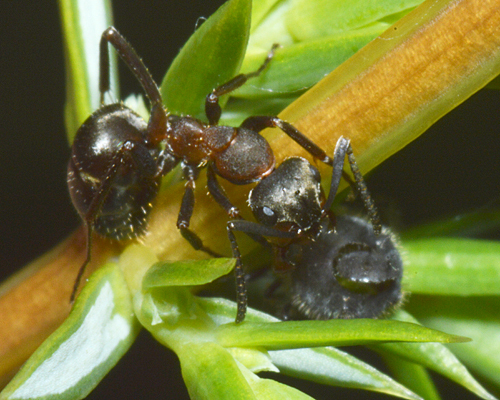 Jaskiewicz & Kot (2007) found that Cinara juniperi is rarely visited by ants. On the other hand, when we visited Dundreggan in July 2013, Cinara juniperi was present in low numbers on only a few juniper trees. 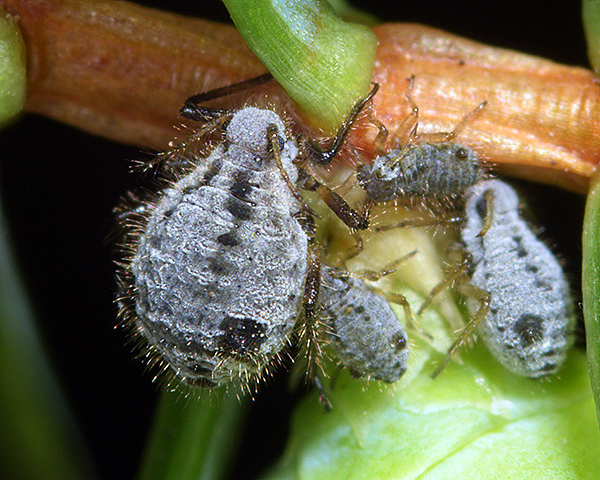 Moreover, other aphids tended by Formica ants such as Symydobius oblongus were very scarce. 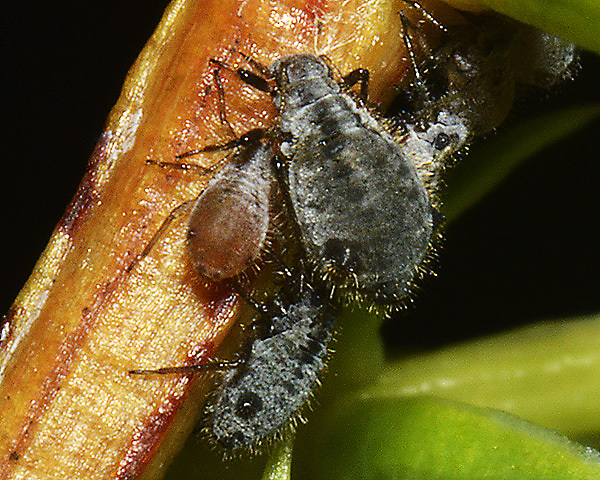 At this time colonies of Cinara juniperi were closely and enthusiastically tended by Formica lugubris, sometimes with multiple ants to each aphid as can be seen above. It seems clear that intensity of attendance is not a constant feature of an aphid-ant relationship, but is dependent on the availability to the ants of alternative sources of honeydew. 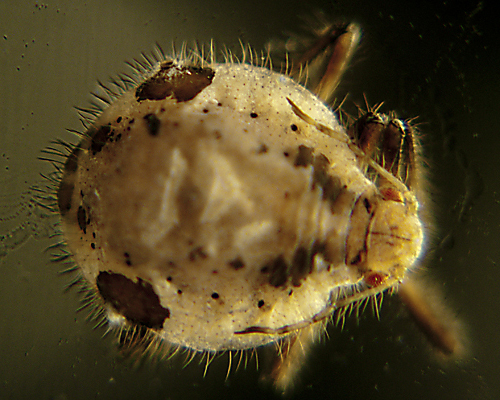 At times of honeydew scarcity, ants may even tend dead aphids as in the picture above in the (rather futile) attempt to elicit honeydew production from a Cinara juniperi mummy. Cinara juniperi has been recorded from 13 Juniperus species. Cinara juniperi causes a moderate amount of damage to nursery stock and ornamental plantings of juniper. This is caused by honeydew deposits on the foliage and the growth of sooty moulds. Special thanks to Natalie M. Hernandez, USDA-APHIS-PPQ, for correcting our erroneous identification of an alate as C. juniperi. Baker, E.A. 2012. Aphids and their parasitoids at the Dundreggan estate - draft report. June 2012.